﻿ France-Charente-Cycling tour around Cognac. Self-guided biking holiday in the land of the Nectar of the Gods: Cognac. A short 5-night stay in Charente, between Cognac and Angoulême, this tour can be extended to 7 or 8 days and can also be combined easily with another tour around Bordeaux. Vineyards, the River, villages of white limestone, forest : in a part of France off the beaten tracks, with gentle slopes, vines that weave through valleys. The farms where the “Eaux de vie” (Water of Life) Cognac is distilled can be visited, and the Charente river meanders through villages. Towards the South, white cliffs and oaks line small country roads. Welcome to Cognac. Arrival by the Cognac train station, transfer and night in your hotel in the city center. Gourmet dinner. Cognac – Jarnac - Angoulême 50 to 60 km Along the Charente River Valley between vineyards and water. François 1er was born in Cognac and Angoulême is famous for its international comics festival. The road will lead you to Saint Brice and Abbey Chatre, the dolmen Guard Sword, Bourg Charente where you can have lunch at the "Bistrot" (One“Michelin Star” restaurant) before joining Jarnac, the birthplace of Francois Mitterrand where a museum relates the roots of the former President. Follow the roads through the vineyards and picturesque villages with the river never far off. The heart of Angoulême is built on a promontory overlooking the river and valley. Night in a hotel and gourmet dinner in one if the numerous and flavoursome restaurants of the historic center. 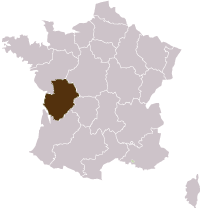 Angouleme – Roullet Saint-Estèphe. 30 to 40 km Or Montbron – Roullet Saint-Estèphe. 60 km Through forests, plains and along rivers, enjoy the south of Angouleme discovering villages, churches & legendary places. At Mouthiers sur Boëme, take your time and visit Calvin's pulpit, the Gardens classified as remarkable (Jardin de Forge), and simply enjoy this peaceful place and the pleasure of riding along the water. Night in a hotel with swimming pool and large garden. Gourmet dinner. Roullet St. Estephe – Bassac. 45 km Back in Cognac country. Between the vineyards and fields, glens and valleys, discover around the corner on a hill the ruins of a castle and the scenery from a promontory. When the weather is fine, you can see said one, as far as the sea ! Ride along the terraces where once the vines were cultivated. Make a stop at Domaine Breuil to taste their wines, cognac and Pineau des Charentes from “Green” agriculture… delicious. Night in hotel. Gourmet dinner. You may enjoy Cognac tasting here. Bassac - Cognac. 30 to 40 km Once again, cross the Charente to enter the “Must” of cognac vintage : " la Grande Champagne". Downhill, Segonzac is the capital of the 1er Cru Cognac that you can taste at the House of Grande Champagne as well as by growers of Cognac. Finish your ride on the small roads through Cognac vineyards to join the city. Night in your hotel. Dinner by our own. This tour can be extended to 7 or 8 days : ask for the program ! 790 € per person for a 5 night tour in double room. 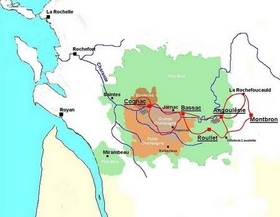 The transfert between Cognac train station and Angoulême train station : + 40 € per person. Starts in : Cognac train Station. Access : TGV from Paris to Angoulême and TER to Cognac (3h15).